Sheffield's famous JuJu Club returns with a bombastic night of live global music, featuring Onipa the most exhilarating African music band in the country, fusing West African music culture with modern dance music and delivering a ferocious rhythmic kick. Tracks from their first release the EP 'Open My Eyes', on the Wormfood label are currently tearing up the dancefloors across the land. 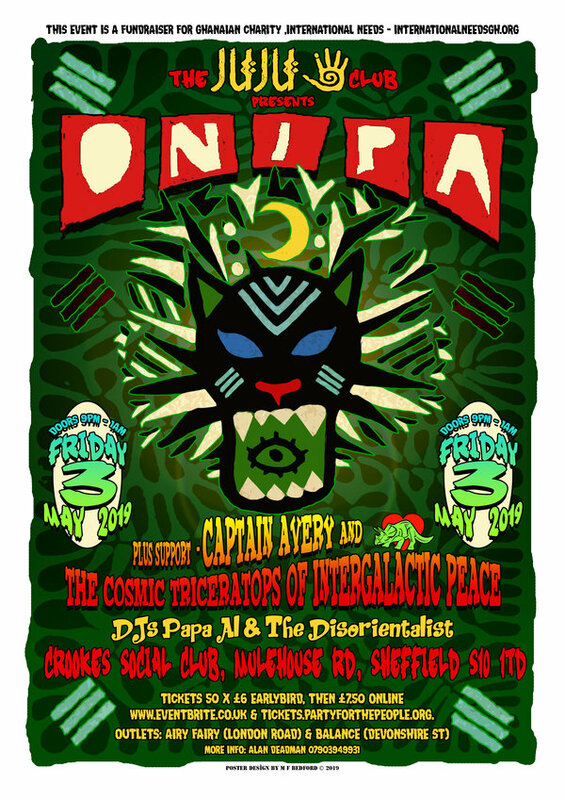 Supporting them are 'Captain Avery and the Cosmic Triceratops of Intergalactic Peace' a band of self-described intergalactic sonic miscreants, playing psychedelic afrobeat with flavours of high life and a smattering of garage rock. Expect wild dancing. DJs Papa Al and the Disorientalist add fire to the brew. All profits from the gig go to International Needs, a Ghanaian charity.